2012 Season of Giving Continued on Friday at Grape Road Meijer! by TJ Jorgensen - Check out the video highlight of Season of Giving on the video page! 12/21/2012- Following up to the 2nd annual Street Kids Care Season of Giving event on Tuesday in Mishawaka where SKS members presented gifts and groceries to a South Bend family, some of those same members of Street Kids were at Grape Road Meijer on Friday, taking a family on a shopping spree just in time for the holidays. After helping the family at Epic Church on Tuesday night, I wanted to do something more for another family, so I talked with Alyssa Fowler, who has been working with Street Kids Care for several years. She works with families every day that could benefit from our Season of Giving events, so I asked her to find me a family. She worked with other case managers and selected a grandmother who was raising her two teenage grand daughters. We spent about an hour on Friday shopping with them for winter coats, new clothes like jeans, sweaters, and lots of other girly stuff that none of us players knew anything about! But today was about helping others, and thats what the players and those involved with Street Kids Care thrive on. "I'm excited to be here to help out Street Kids Care and take this family shopping," said Jay Jeffery, who along with myself, Mike Bailey, Joe Horvath and Tony Hardiman were on hand to help two teenage girls and there grandmother shop. "Our goal is to put others before us, and what better time to do that than the holidays?" Shopping with Gerri and her teenage grand daughters on Friday was such a blessing. Christmas is about putting others first, and that is what we were lucky enough to do today. The smiles on the faces of this family was more than enough for me and the players that took part today. I want to thank not only Alyssa Fowler for her tremendous work in finding the right family, but also Grape Road Meijer for their support as well as Epic Church, who has partnered with SK Care the last two years. I am also proud of SKS players Joe Horvath, Jay Jeffery, Tony Hardiman and Mike Bailey who all braved the cold weather to come out on a busy shopping day to help this family. I also want to thank Bret Yoder of Pure Logistics who volunteered to come out and take pictures today. 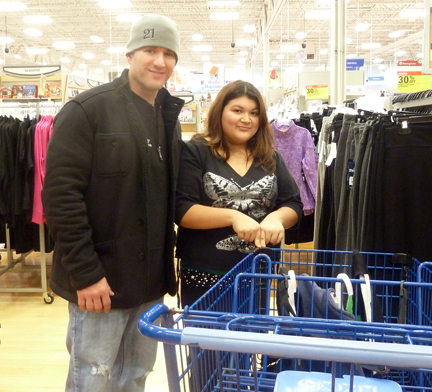 To see pictures from Friday at Meijer, visit this link on Facebook. Happy holidays from Street Kids!